Mumbai-based White Shadow Technology Pvt. Ltd that operates online business-to-business (B2B) marketplace Bharat Bazaar has raised an undisclosed amount in seed funding from a clutch of investors. The investors participated in the round included BeeNext, a Singapore-based early-stage technology fund; TV Mohandas Pai, chairman, Manipal Global Education Services and Aarin Capital; and Kunal Shah and Sandeep Tandon, co-founders, FreeCharge. Rohit Bansal and Kunal Bahl, co-founders, Snapdeal; Anupam Mittal, co-founder, Shaadi.com; Amit Gupta, co-founder of InMobi and Tracxn Labs, among others, also participated in the round. Data analytics firm Tracxn, which runs Tracxn Labs, competes with News Corp VCCircle's data research platform VCCEdge. 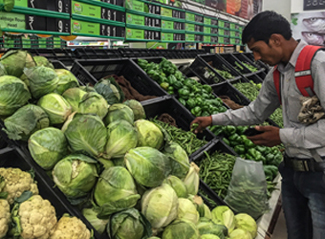 Founded in July 2015, Bharat Bazaar is a mobile app connecting buyers and sellers in the wholesale fruits and vegetables supply chain. Earlier this year, Bharat Bazaar raised over Rs 2.5 crore ($370,000) in an angel round of funding. The startup partners with farmers, local aggregators, wholesalers, bulk buyers, food processing players and exporters. Its buyer-base is spread across Maharashtra, Delhi, Madhya Pradesh, Karnataka, Gujarat and Rajasthan. “There has never been a better time to digitise agriculture in India. Supply channel bottlenecks and lack of a proper marketing channel are problems for a farmer who is already burdened with a host of troubles. We plan to tackle these issues,” said Saurabh Jain, co-founder, Bharat Bazaar. Jain is an engineer from IIT Bombay. Jain worked with Fractal Analytics prior to co-founding Bharat Bazaar. He also served as head of analytics at food- delivery startup TinyOwl which shut down. The funding will be used to increase the technology team size and enhance its presence across multiple Indian cities, Jain told Techcircle.in. Bharat Bazaar aims to reach 50,000 users by December this year. “Agriculture and allied activities are the single-largest source of employment in India and this sector has an immense potential for disruption,” said Kedar Gokhale, co-founder, Bharat Bazaar. Gokhale and Jain studied together at IIT Bombay and graduated in 2010. Prior to co-founding Bharat Bazaar, Gokhale worked at Boston Consulting Group and managed rural sourcing at Aasaanjobs. Of late, the agri startup space has been seeing some investor interest. In January, Siddhivinayak Agri Processing Pvt Ltd, a Pune-based potato supply chain management company that operates as SV Agri, raised an undisclosed amount in a Series B round of funding led by impact venture capital firm Lok Capital. The deal marked Lok Capital’s first investment in the agriculture sector. Last year, Bangalore-based agri supply chain Ergos Business Solutions Pvt. Ltd raised seed funding from Aavishkaar Venture Management.